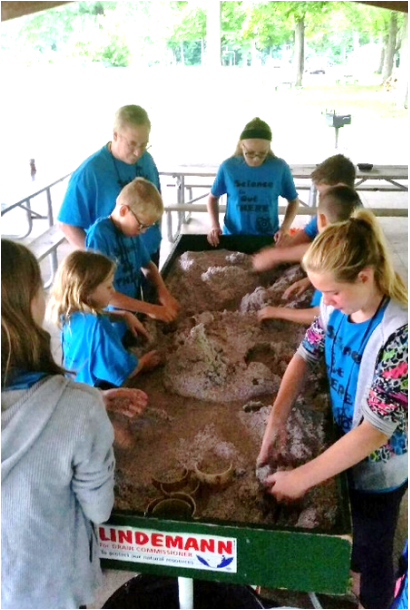 The Science Adventure Camp is an opportunity to get youth excited about science. We focus on outdoors, hands-on, fun activities! This event is open to current 3rd, 4th and 5th graders for the 2018-2019 school year in Eaton County, and will take place at Bennett Park in Charlotte, MI. Cost for the full week is $15. There will be an AM and PM session. experiments, transporting students between sessions, and registration. "Thank you so much for the past two years of offering this to Eaton Co. students. My daughter absolutely loved going to this camp. She still talks about it and is so proud of the rock collection she has grown in the past two years. Bravo to the instructors who volunteer their time and supplies for these children!! My daughter is currently holding a 100.86% in 6th grade Science class at [...]Middle School!! I'm thinking Science Adventure Camp has helped to keep the interest in Science alive! My husband and I couldn't be more proud! Please pass on our gratitude to all the volunteers involved!"